This Easter cheese board is so perfect to make and enjoy on Easter with family and friends. It’s beautifully bright and full of the most delicious cheeses, nuts, fruits, veggies and more. Elevate your Easter menu with this gorgeous cheese board to snack on before the big meal. It’s got a little of everything to keep everyone eager and satisfied. I’m thrilled to be partnering with my friends at Santè Specialty Foods to share this beautiful board with you. 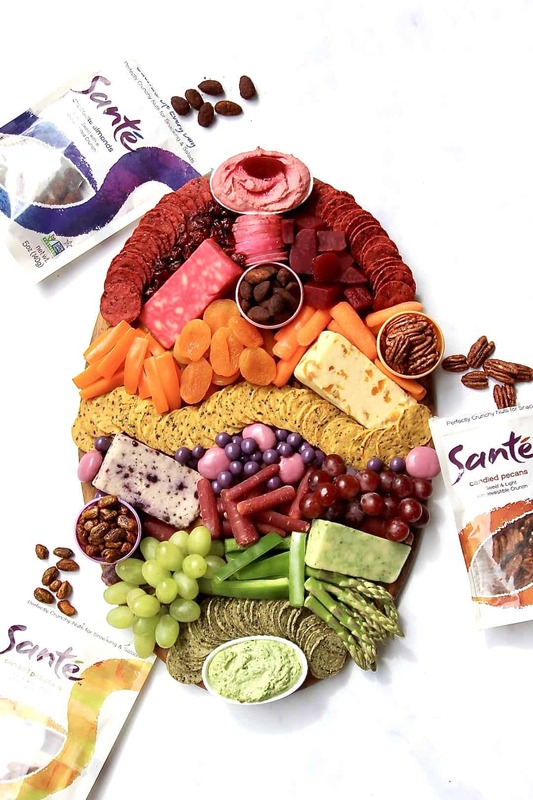 We are literally nuts about Santè nuts! Can’t get enough of them. From the new chocolate almonds to the classic candied pecans, these nuts are addictively crunchy and perfectly seasoned. They make for such a great addition to this Easter cheese board. Be sure to check out my Instagram post for this Easter Cheese Board where you can enter to win 6 bags of Sante Chocolate Almonds, this gorgeous Olivewood and White Marble Oval Board, and this beautiful Olivewood Cheese Knife Set. I always add nuts to my cheese boards because they’re so snackable and pair so well with all the other goodies. The crunch of a nut combined with the creaminess of a cheese is one of my favorite combos when grazing on a great cheese board. Santè’s new chocolate almonds are lightly dusted in a blend of cocoa powders so they have this rich chocolate flavor with just the slightest sweetness and a touch of salt. They pair so well with every cheese and fruit on this board. The candied pecans and their other candied nuts are sweeter than the chocolate almonds, but what I love so much about them is that they’re not too sweet or overly coated with the candied glaze. They have a thin candied glaze that keeps them super crunchy and lightly sweetened. 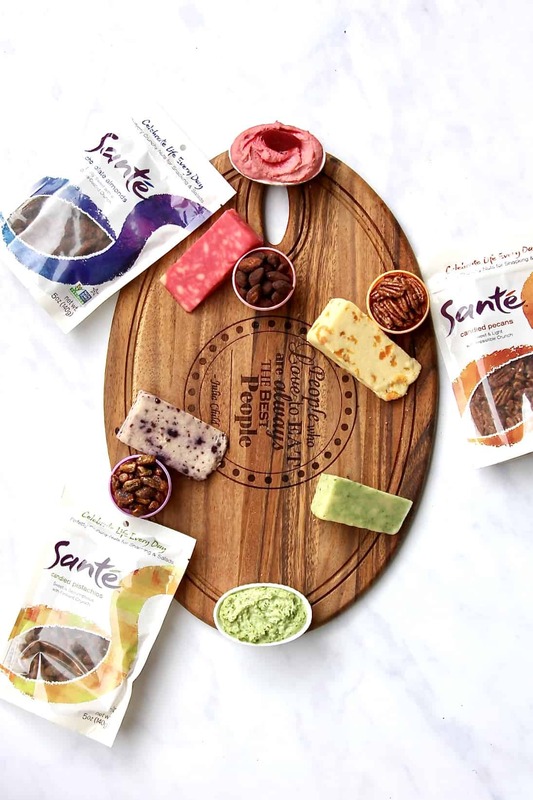 I could go on and on about how perfect Santè Nuts are, but you’ll have to try them for yourself to really taste the difference. They’re non-GMO, gluten-free and made in a peanut-free facility in Santa Clara, California. You’re sure to be impressed and become just as obsessed as I am! 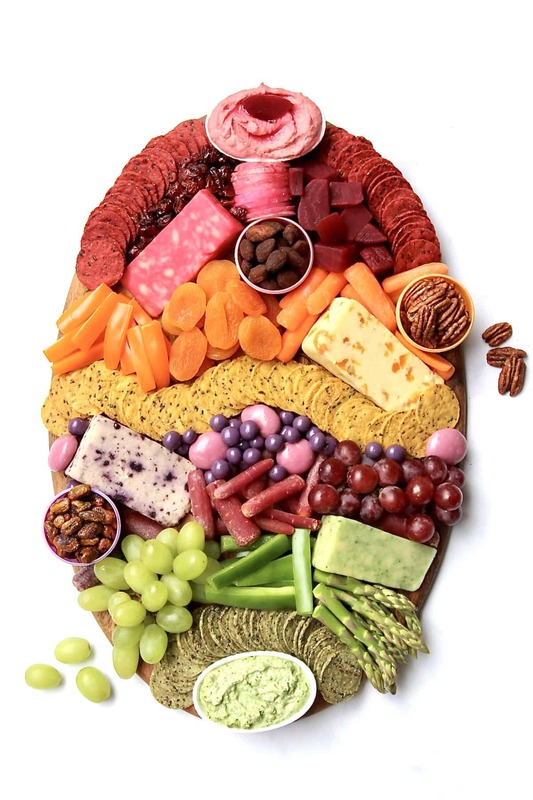 To make this board extra Easter cute, I used the flat bottoms of three plastic eggs to serve the nuts out of and I created bright layers down the oval-shaped board with all the cheeses and other goodies to make it look like an Easter egg. If you don’t have an oval-shaped board, you could use any large board and just shape the goodies into an Easter egg in the middle of the board. 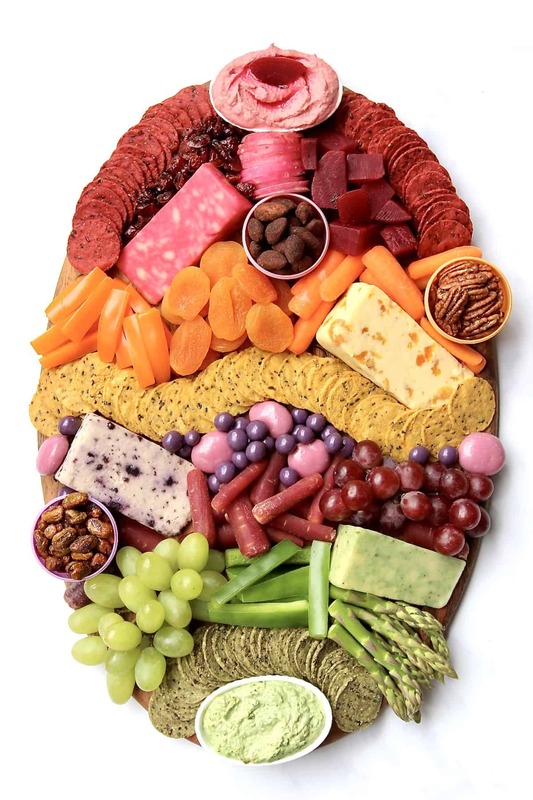 Cheeses, nuts and dips first followed by the grapes and then all of the other goodies grouped by color down the board to create that beautiful decorated Easter egg look. Super simple and sure to be a stunning addition to your Easter celebration. Enjoy! This post was created as part of my partnership with Santè Specialty Foods however thoughts and opinions are certainly my own. Thank you for supporting the brands that make The BakerMama possible. 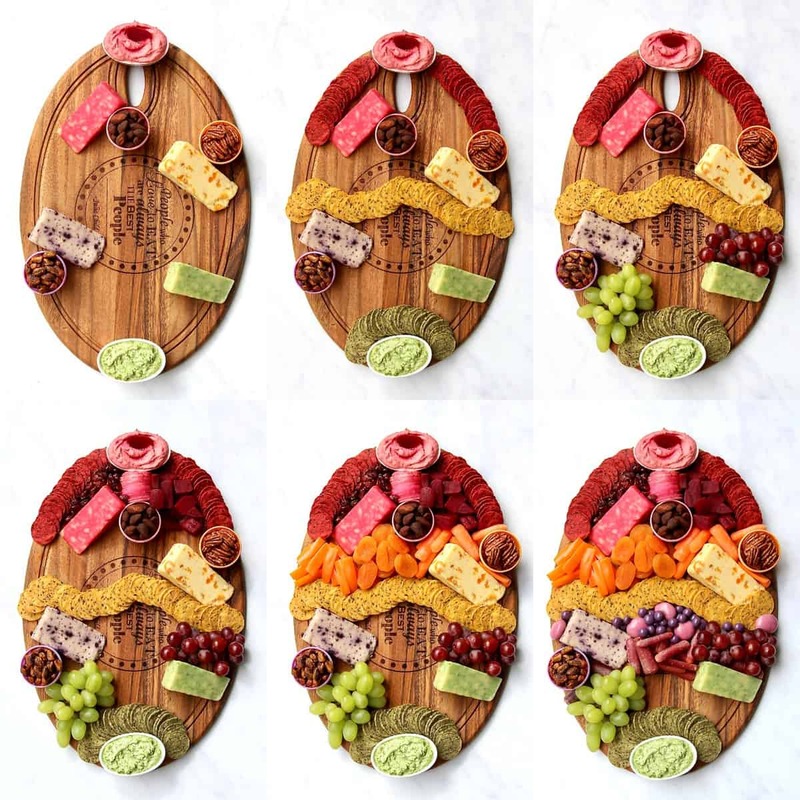 On an oval-shaped wood serving board, start by placing the Red Windsor cheese toward the upper left, the apricot cheese toward the middle right, the blueberry cheese toward the middle left, and the green sage cheese toward the bottom right. Use the bottom halves of 3 (4-inch) plastic Easter eggs to serve the nuts out of on the board. Preferably a pink egg for the chocolate almonds, an orange egg for the candied pecans and a purple egg for the other candied or spiced nuts. Place the chocolate almonds near the Red Windsor cheese, the candied pecans near the apricot cheese and the remaining nuts near the blueberry cheese. Put the beet hummus and spinach dip in small oval shaped serving bowls. Place the beet hummus at the top of the board and the spinach dip at the bottom of the board. Place the purple grapes in line with the blueberry cheese and the green grapes in line with the green sage cheese. Put the beet crackers on either side of the beet hummus. Zig zag the sweet potato crackers across the middle of the board. Fan the green crackers around the spinach dip at the bottom of the board. Place the dried cranberries, radish slices and beets at the top of the board to fill in the first layer. Place the orange bell pepper strips, dried apricots and baby carrots in line with the apricot cheese to fill in the next layer. Place the pink and purple chocolate covered fruit and the purple carrots in line with the blueberry cheese to fill in the next layer. Finally, place the green bell pepper strips and asparagus tips in line with the green grapes and green sage cheese to complete the bottom layer on the board.